Alright. Let's get this out there: I have no mandatory dietary restrictions. Not one. Zero. Sure, I choose to not partake in the meat department, but that's on me. I'm not allergic to it (though after going without this long, I don't imagine it would go great), and (as far as I know) I'm not allergic to anything. In the WORLD. Okay, let's not get crazy, but I'm seriously unaware of any particular thing that I could not successfully eat. I ate many wild raspberries found along our bike path the other day (okay, maybe 12 or so, and they were delightful) and I maybe have worried about feeling a slight tickle in my throat or extra flush on my cheeks, but: NOTHING. NADA. Completely fine. Fingers crossed. And to be clear, I'm not saying this as any sort of bragging right. I'm more and mostly just .. amazed. Stunned, even, that in a world where we're all swearing off gluten or nuts and everything in between, that I can sit here, eating a piece of toast with peanut butter, happy as a clam. You know, without any actual clams involved. Doesn't that seem crazy? And where are everyone's allergies coming from all of the sudden? I mean, I'm sure if I took an allergen test I'd find out I probably shouldn't have too much of this or of that, but why the heck would I do that? Reminder: bread, peanut butter, happiness on a clam-like level. That's all I'm saying. So the allergy-crazy world is a subject for another day (and probably another blog), but quite a number of people in my life could be (okay, are) categorized on the severe level. I mean, can eat quite literally next to nothing. So close to nothing that they eat nearly the same thing, every day, every week, all the time. Variety is something they know nothing about. It keeps them from going out to eat with friends. It makes holiday gatherings rooough. It makes every meal a dilemma and a hurdle. It makes ordering off of any menu a slew of questions that still don't leave them very confident in what they can order. And it's SAD. And one of these particular (lovely!) 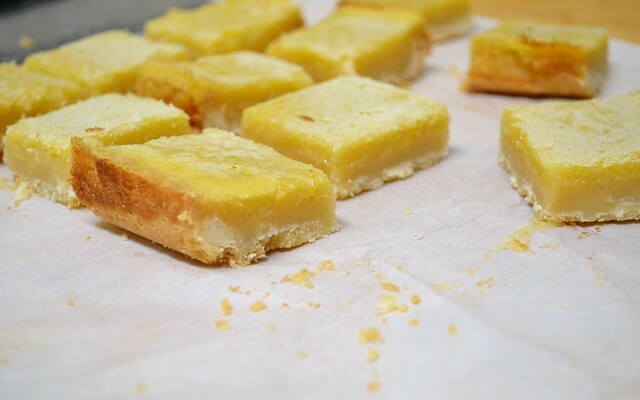 people happens to be a girl I am lucky to work with, who made the "mistake" of confessing that all she wanted...all she craved...was a legit, classic, old school, tart, tangy lemon bar. A lemon bar, I thought? That has to be gluten-free? And soy free? And ... other-stuff free? (You can ask her, I had a lot of questions.) And I totally get that this option is probably hard to come by, even in bakeries that tend to boast a lot of gluten-free or vegan or allergy-sensitive options. What you'll likely find are brownies, definitely chocolate chip cookies, maybe some cupcakes. But lemon bars? I realized this was a too-good treat that I rarely saw in the regular bakeries anymore. When did we stop going sour? So now that I knew she'd be craving these things (FOR SO LONG I CAN'T EVEN SAY IT), I was on a mission. I HAD to make these for her. It was only fair, that I, someone who can eat anything just about any time, should make these for her. And I really wanted them to be good. I mean, so good that you wouldn't even know they were gluten-free. Which, unless it's a bowl of regular ol' rice, is kind of a feat in itself. But: IT CAN BE DONE. 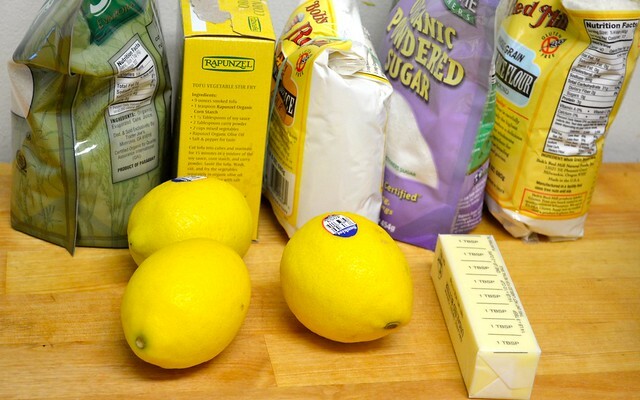 And it has been done, because behold, below you will find the ingredients needed for these pretty amazing lemon bars. For both rice flours, you can easily find these in the Bob's Red Mill brand in the baking aisle of your grocery store. The sweet rice version might be a tad more obscure, but it's definitely out there. Preheat your oven to 350 degrees. Generously spray an eight-inch pan with nonstick spray and line with parchment paper (the parchment step will make your life much, much easier, as I found out the hard way during one of my attempts for the perfect lemon bar). In the bowl of a food processor, combine your flours, cornstarch and confectioners' sugar. Pulse together until evenly combined. 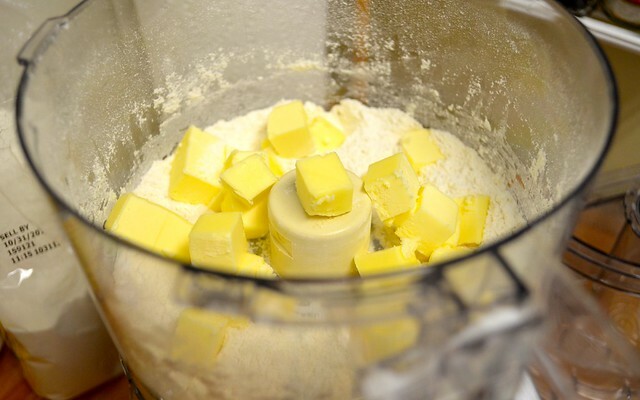 Add your butter and pulse until the largest pieces are no larger than a pea. At this point, add your water (slowly) about half a tablespoon at a time. Allow to pulse between additions to see if your dough comes together. If it still appears crumbly, add more water. If not, turn out into your prepared pan and press evenly until your dough is evenly distributed. Chill in the refrigerator for fifteen minutes. After your dough has set, bake for about 40 minutes or until lightly golden brown on top. It will basically smell like a giant sugar cookie at this point, which noooobody will be mad about. When your dough is nearly done (about 10 minutes or less), you can begin to prepare your filling. 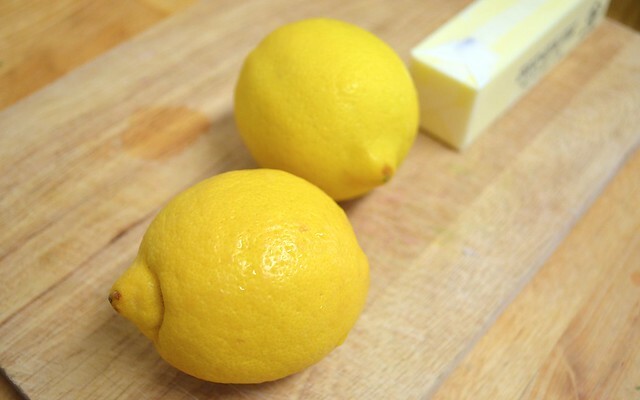 Start by adding your sugar and lemon zest to a medium bowl. Scrunch the zest and the sugar together between your fingers, which will bring out the lemon-y zing of the zest (a trick I originally learned from Smitten Kitchen while making this other lemon-based dessert). 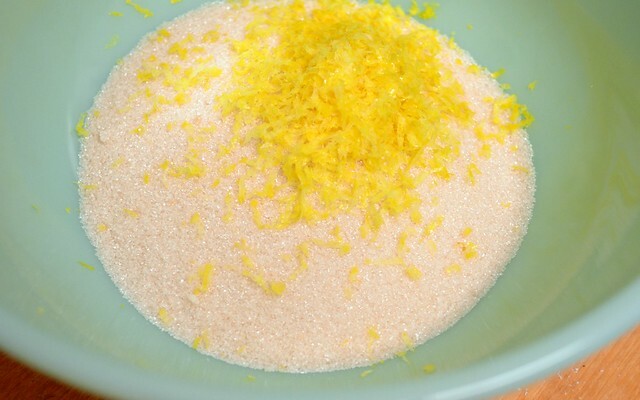 To your zest-sugar combo, whisk in your eggs, lemon juice and brown rice flour until smooth. Once your crust base has come out of the oven, carefully pour the filling over the top. Give it a gentle shake to make sure it's evenly distributed and then return to the oven for 12-15 minutes, or until the center of the filling no longer wobbles. Transfer to a wire rack to cool. And as much as I am an advocate for not listening to proper cooling times before going right for dessert: these guys are actually better if you wait. I know, crazy, right? The filling sets up a little more, the lemon flavor intensifies. Trust me, it's all worth it in the end. Once cool enough, transfer to the fridge to properly chill (something I was telling myself to do, right about then) for two hours or up to overnight. This step makes slicing a breeze. 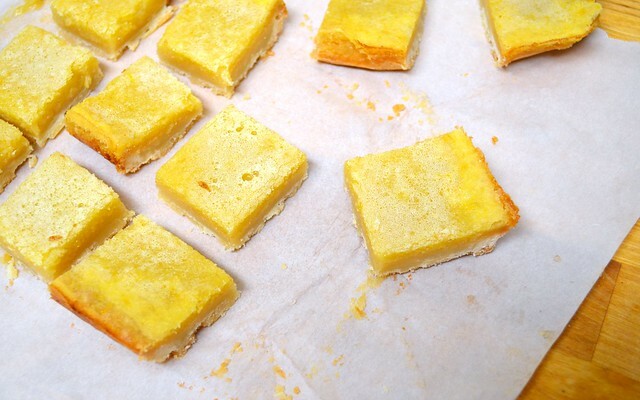 To serve, dust with a bit more powdered sugar (you know, for that classic lemon bar look) and serve to all your gluten-free friends who will then love you forever. 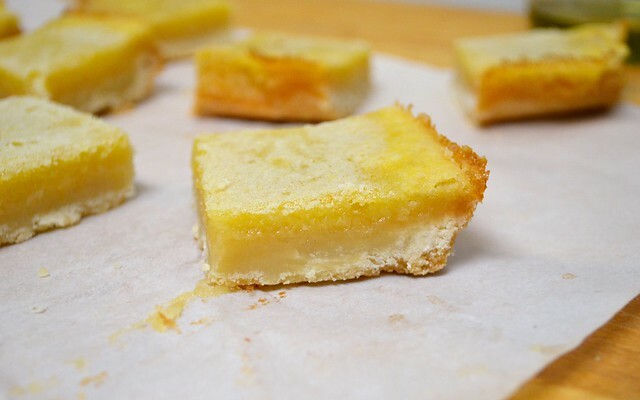 I mean, I haven't had a ton of lemon bars in my lifetime, but comparatively, these are spectacular, spot-on and not missing a thing. Your gluten-ful friends will be none the wiser.